Salvador Dalí is getting his own building, in St. Petersburg, Florida, of all places. Salvador Dalí, that Surrealist madman the art critic Robert Hughes once described as a “pretentious, whorish old fanatic,” finally has a monument as twisted as he was: The new Salvador Dalí Museum in St. Petersburg, Florida. 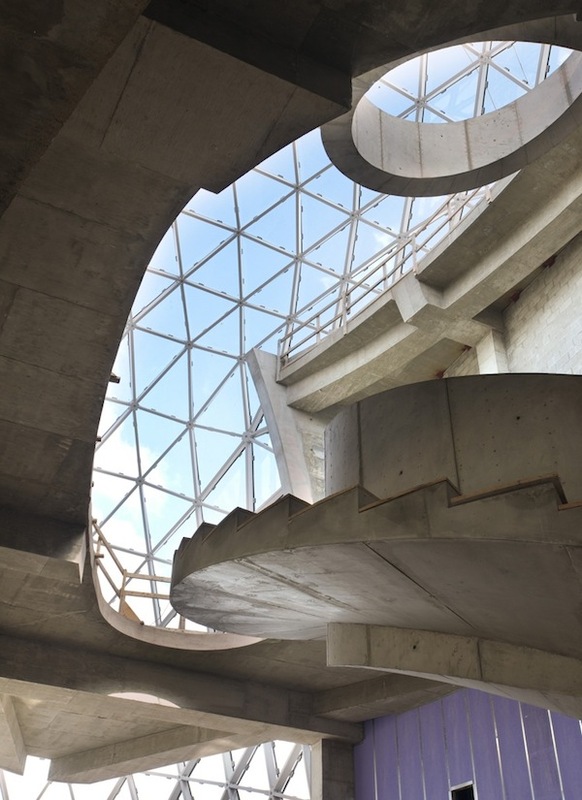 Designed by HOK, the museum–which opens in early 2011 and which replaces an old building that supposedly houses the world’s largest Dalí collection outside his native Spain–is 66,000 square feet wholly befitting his shtick. 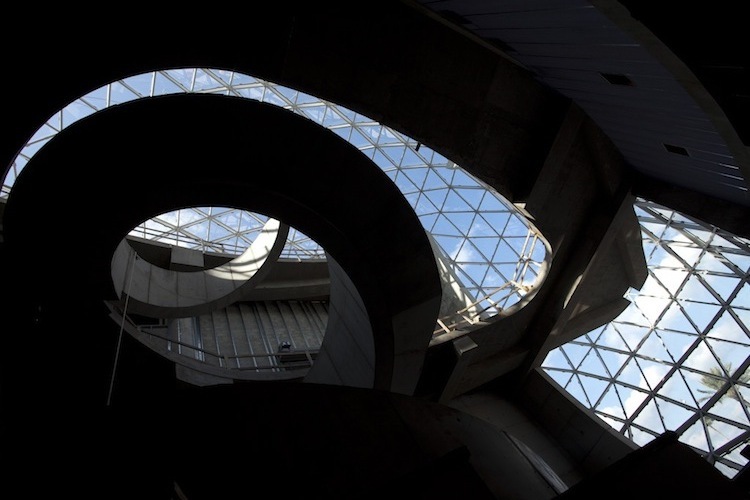 Outside, you’ve got a concrete box sprouting what looks like a glass tumor, and inside, a stairwell spirals up into the ether–a nod, we’re told, to Dalí’s fascination with DNA. A safe choice when you consider all the other allusions they could’ve made. His fascination with adolescent horniness, for example. The concept is meant to hint at the tension between the rational world and the utter nonsensical claptrap that Dalí was always trying to throw up on canvas. From the press write-up: “A strong, poured-concrete Euclidean ‘treasure box’ protects the art, but is then broken, disrupted, by the flowing, organic, triangulated glass ‘Enigma’… It is as though a glittering jewel is bursting from the ‘treasure box’.” So we are talking about adolescent horniness! We confess: We’ve never understood Dalí’s attraction. He spent so much time trying to shock the hell out of everyone that he forgot how to make art that would appeal to anyone other than angsty 13-year-olds. He’s a smart guy who used his talent for all the wrong things–a phenomenon whose equivalent today has to be Marilyn Manson. That seems to be reflected in the museum itself. The guy behind the Dalí museum is Yann Weymouth, who worked with I.M. Pei on the legendary renovation of the Louvre and who obviously knows his way around a T-square. 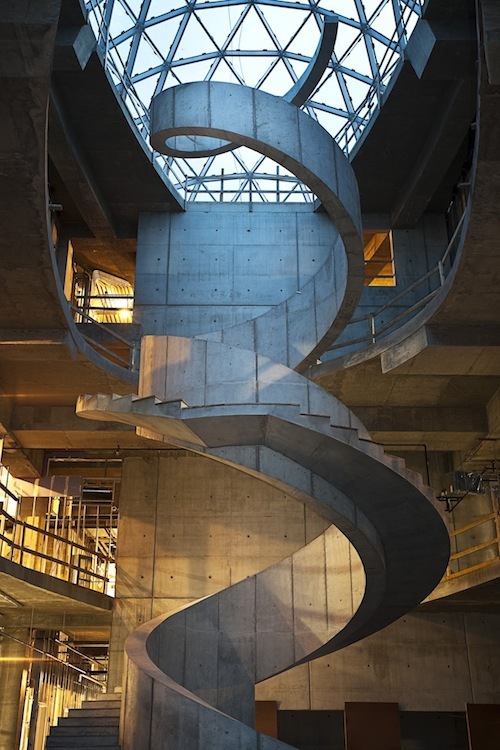 The tumor–or enigma, whichever you prefer–is the first free-form geodesic bubble of its kind in the United States, and the spiral staircase is obviously a feat of concrete engineering. But when you put it all together, the art likely plays second fiddle to the spectacle–and the building assumes that viewers have such a short attention span they need something other than art to grab and hold their eye. In a weird way, it’s the perfect tribute to that pretentious, whorish old fanatic.